So we just had a huge Swarm yesterday with 57 ladies and their Cricuts. It was a blast. But one of the coolest things was that my sister-in-law, Becca, came for the Swarm - all the way from Texas!!! Becca is super duper awesome, and I just adore her. So what better way to show someone you love them than to make cute stuff for them, right? 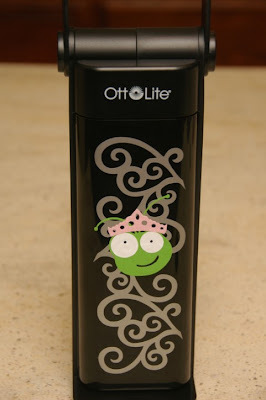 Becca bought this black Ott Lite today on sale at Michael's, and we decided to dress it up. I got out the vinyl, and we went to work. We decorated both the front and the back using the Storefront cartridge as well as Storybook. Hmmmm, I think I like it too much and want to swap Ott Lites tonight while she's sleeping. By the time she notices, she'll be back in Texas! Should I do it? I also made Becca this silly scrap shirt. 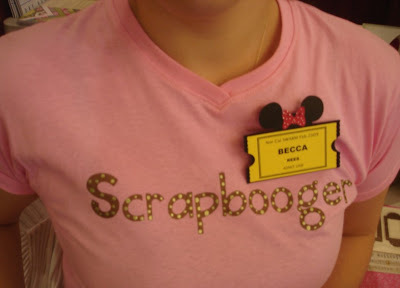 Yes, it really does say "Scrapbooger". She loved it and wore it to the Swarm. It says "Scrapbooger" because my sweet daughter called us that when she was about 3, and she was cranky at us for scrapping too much, LOL! Since then, Emily has had a change of heart and now wants to scrap with us! She's learning to use the Cricut, and I let her use it all by herself today for the first time. She's only 5 1/2, but she did a fabulous job! It's been a crazy fun weekend - thanks for stopping by!! Cute light Monique. I had a blast yesterday. You did a great job of putting on the event. Great light, cute t-shirt, and looks like fun was had by all. The Swarm was awesome with so many ladies helping! Cute shirt. 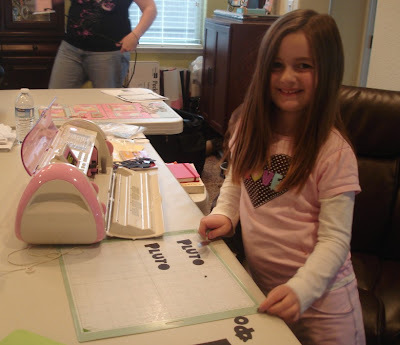 Becca loves her Scrapbooger title. She says it's a real icebreaker! And the lamp is so adorable. I will be customizing mine soon! 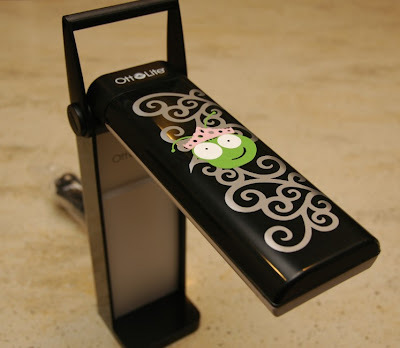 I'm considering buying a cricut. Can I download a shape or logo of my own and cut that out? OMG... this is so cute!!! 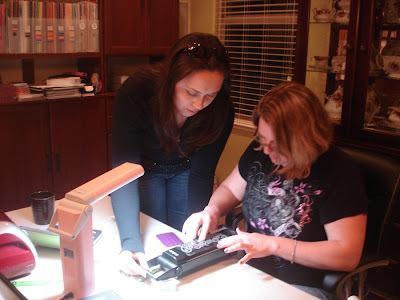 I recently bought an Ott lite and I am so scraplifting this idea. I love your blog. You make some of the best layouts. Where do you find your inspiration? Oh! 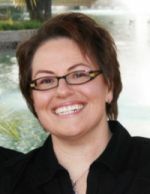 And congrats on the Above Rubies Master Designer position! I really enjoy visiting your blog and looking at all your creations. 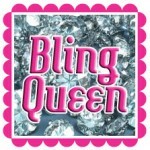 I have a Blog Award waiting for you on my website. Looks like everyone had a great time. Wish I could find something like that down here in San Diego. Where did you find the bug logo? I've been trying to find one that I can cut out of vinyl for my notebooks and cartridge storage box. Would you mind forwarding me the information? 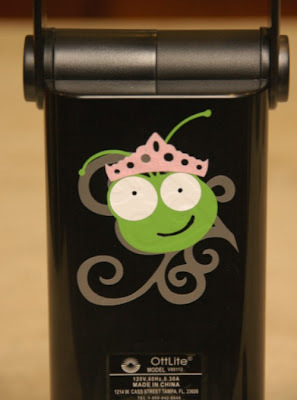 Love that little cricut with her pink tiara!! !